Jack and the Baby Talk: It's the Holidays! The Baby has become a singer. She sings along to the radio, she sings to the television, but she especially loves it when someone sings to her. It just makes her smile every time. I can't wait until she can start hearing someone who can actually carry a tune, she might enjoy it even further. The family ventured out to NorthPark Center to visit the timeless and famous Santa Claus. He has been doing this for over 20 years, so he is pretty popular, especially amongst Dallas' finest shoppers. The Wifey and I were actually at the mall the previous night to find a Christmas outfit for the Baby with the grandmother. We asked the Santa's helpers what time we should be there to take pictures with Santa and he said, "well, I start handing out numbers at 9am, but there will be a line of twenty people waiting by then." And he wasn't joking. There were already 40 people waiting in line to get their number at 9am the next morning. So the family and I just walked around the mall and had breakfast and waited until our number was called. Santa didn't start taking pictures until 1030, so we figured we would check in around 1230 to get the pictures taken. As we waited in line, some NorthPark newbies would walk up and casually step in line and act like it was first come, first serve general admission photo session with Santa Claus. Sorry folks, this isn't K-Mart. Grab a number and come back later. By the time 1230 rolled around, the number was at about 178 (only 195 numbers are handed out throughout the day) and Santa's helper kindly informed #178 to return around 6pm that night for their pictures. And the parents were infuriated. They thought they could just waltz right up to one of the busiest malls in Texas and get their pictures taken. I thought it was nice that the helper was giving them a rough time estimate to come back. At least they could do other stuff for the day rather than wait in line. But I did feel bad for the kids. Their parents get them all dressed up in their finest holiday outfits and go to a mall, where they aren't allowed to buy anything, to wait in line to go see Santa, and then get turned away because their parents didn't have the foresight to plan accordingly. Well, lesson learned kiddos. 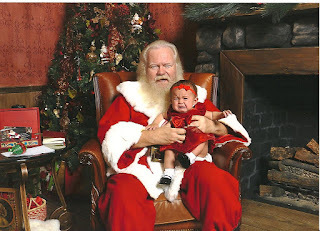 We hoped for really cute Santa pictures but I secretly wanted a crying Santa picture. I think those are the best. 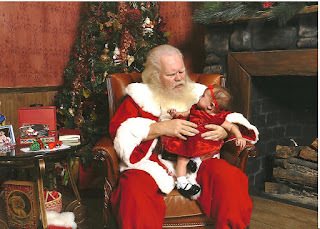 Once I put the Baby on Santa's lap, she looked at me with a quizzical expression, glanced at Santa, and then freaked the hell out. And Santa played it cool. He just smiled and held her while the camera flashes went off. But at least she has a really pretty Christmas dress, compliments of the awesome grandmother. It was a great experience. The Wifey and I debated whether it was worth it to wait three and half hours for this particular Santa. But NorthPark Santa is definitely a professional dealing with all these obnoxious, crying, bratty kids. And then there are those kids who are truly amazed by him and Christmas Spirit and it was just nice seeing the happiness in all the eyes of the children. In other news, we received our family holiday portraits. Our intention was to have some nice photos we can send to our friends and family. We also wanted to bring out the cheesiness of holiday photos as well, so we decided to find some over the top Christmas outfits at the local thrift store. 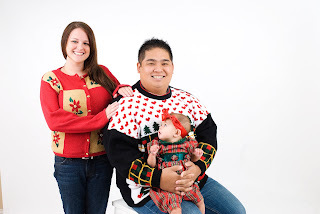 Unfortunately, due to the cuteness of the Baby, her super cheesy Christmas outfit ended up being really cute and we were stuck with awful sweaters. Either our taste is really bad or style no longer exists. I will let you decide, all pictures courtesy of Carissa Byers. NP Santa is the ONLY Santa worth going to. Thanks to my mama, we used to get in before everyone else so we never had to wait in the line. But I know it can be ridiculous!!! I'm glad you got in though and you got to see the greatest Santa EVER! you guys are too cute. Even in your tacky sweaters.